On Thursday July 14, the museum held its fourth annual “Treasures from the Collection” event for members and volunteers. At the event, items from the collections not normally on display to the public are brought out for viewing, and curator Bill Tyre explains the stories behind them. This year, items included clothing, signed photographs of musical friends of the Glessners, a brass fireplace fender from the Alexander Hamilton house, a collection of sterling silver serving pieces from a Prairie Avenue family, correspondence, photographs, and original drawings by Isaac Scott. One textile in particular drew quite a bit of attention. 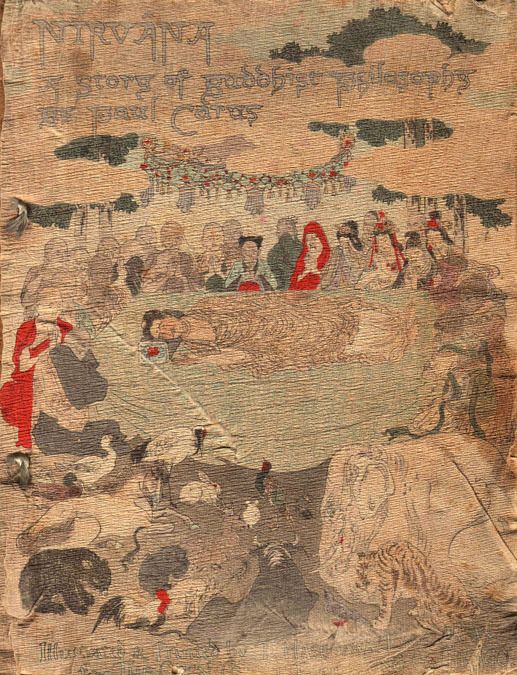 The woven silk lambrequin shown above displays a piece of fabric with an interesting history. The cream colored damask fabric, believed to date to the period 1810-1820, features stylized wood-working tools in red including hand planes, saws, scribes, and pliers. Prominently featured is the name “S*IOSEPH” or St. Joseph, set within a foliated frame. St. Joseph, the earthly father of Jesus Christ was a carpenter, thus the connection to the various tools displayed. According to tradition, this is a surviving piece of the original draperies installed in the courtyard bedroom. 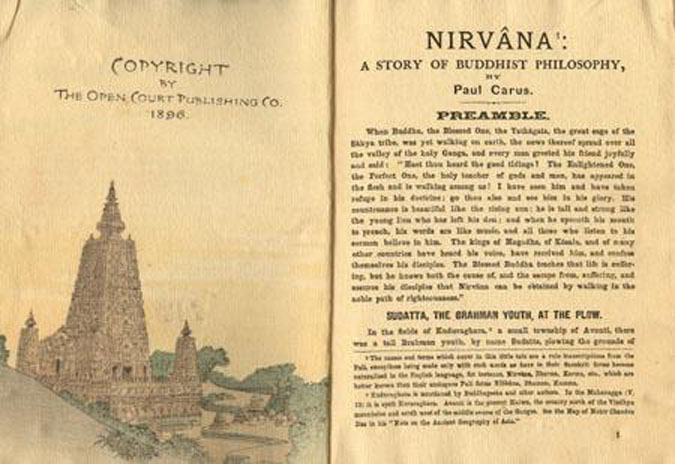 Although no historic photographs exist to verify this, a couple of other pieces of information support the story. For one, the red and white colors of the fabric coordinate perfectly with the red and white De Morgan tiles on the fireplace. For another, a letter recently discovered in the archives from the summer of 1887 (while the house was being finished) makes mention of a fabric selected by Frances Glessner and sent to the architects in Boston for draperies in this particular room. This would support the fact that the Glessners did not choose Morris & Co. fabric for the draperies in the courtyard room, as they did for all the other bedrooms, but instead sent along a fabric of their own choosing. How Frances Glessner came into possession of the fabric, which would have been between 60 and 80 years old at the time, is not known, although she did collect vintage textiles. 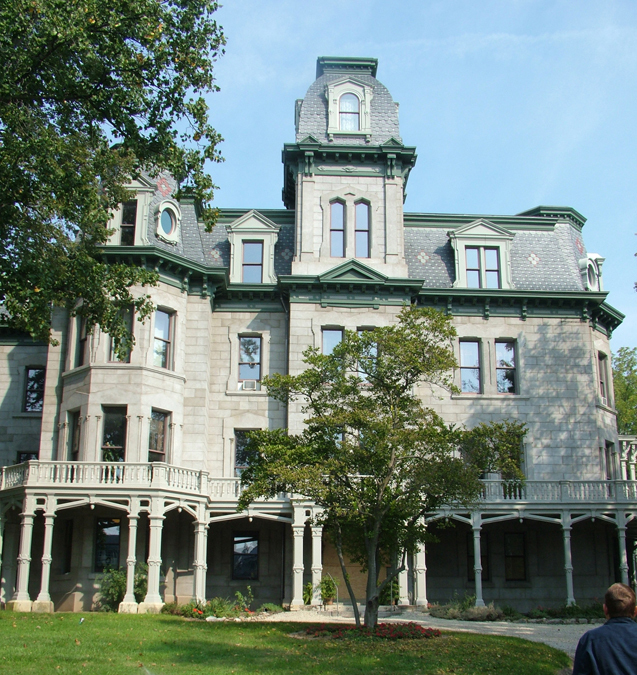 After the death of the Glessners in the 1930s, their daughter Frances Glessner Lee closed up the house and moved its contents up to the Glessner summer estate, The Rocks, in New Hampshire. She took the St. Joseph drapes and had them reworked into lambrequins and shorter panels for her home there. That is the form in which they exist today. The textile provides yet another clue as to the sophisticated tastes of the Glessners as they built and furnished their Prairie Avenue home. Choices were often different from those being made by their neighbors, creating a truly distinctive and unique interior. We are fortunate that so much documentation survives, so that we can interpret the home with such a high level of accuracy. This is the second of two postings giving a brief overview of John Glessner’s business. The last half of the 19th century saw fierce competition in the reaper industry. 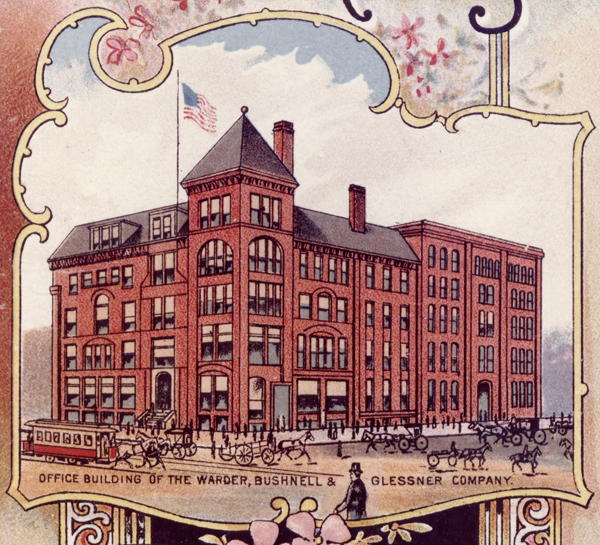 John Glessner’s company, Warder Bushnell and Glessner, was large and successful but was dwarfed by the two giants in the industry – McCormick and Deering. In August 1902, the competition came to an end with the formation of International Harvester, a merger of five companies: McCormick Reaper Company, Deering Harvester Company, Warder Bushnell and Glessner, Plano Manufacturing Company, and Milwaukee Harvester Company. Not surprisingly, negotiations were long and difficult. Representatives from the five companies were placed in separate rooms and messengers carried offers and counter-offers back and forth. Records indicate that John Glessner played a leading role as a mediator, helping to strike an agreement that all could live with. When the new company was formed, Glessner was appointed a Vice President and served as Chairman of the Executive Committee. The company was capitalized at $120,000,000, making it one of the very largest corporations in the U.S. and the world at that time. In 1907, the company completed a new headquarters at 600 S. Michigan Avenue, designed by architect Christian A. Eckstorm, well known for his industrial and warehouse buildings. He designed a state-of-the-art modern building featuring a steel skeleton, high-speed elevators, electric lights, the most advanced mechanical systems of the day, and a floor plan designed to maximize natural light for all of its interior office spaces (not unlike the design of the Glessner House). 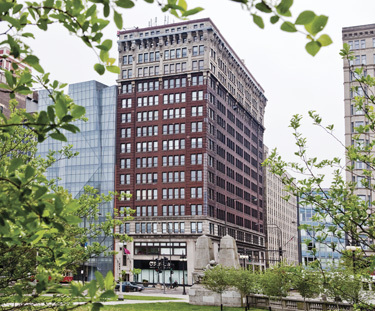 The 15-story Neoclassical brick-clad building featured beautiful stone detailing including a massive bracketed stone cornice, one of the largest ever designed in Chicago. Prominently situated directly across the street from Grant Park, the building exemplified the City Beautiful movement and contributed to the civic consciousness that anticipated Daniel Burnham’s famous Plan of Chicago of 1909. (The building was sold in 1937 to the Fairbanks-Morse Company, and has been owned and occupied by Columbia College since 1975. It is now known as the Alexandroff Campus Center). 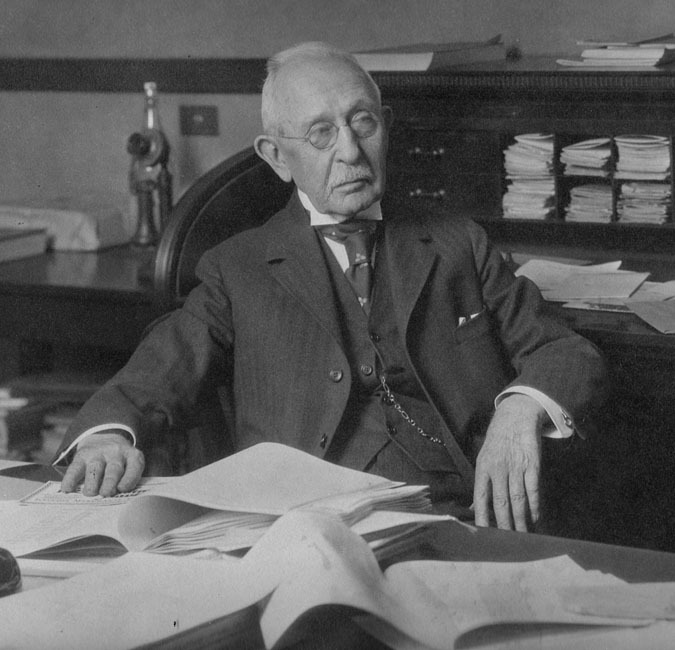 John Glessner retired as Vice President and Chairman in 1919 but remained active in the company for the remainder of his life. He retained office space at Harvester and came to the office daily until just a few weeks before his passing in January 1936, one week before his 93rd birthday. In 1985, International Harvester sold its farm equipment business to the Case division of Tenneco, and focused exclusively on the manufacture of trucks. The name of the company was changed to Navistar in 1986. Today, it is North America’s leading producer of medium and heavy duty trucks, school buses, and mid-range diesel engines. This is the first of two postings giving a brief overview of John Glessner’s company. In 1850, Benjamin Warder of Springfield Ohio paid $30,000 for the patent rights to a reaper and formed the firm of Warder, Brokaw & Child, which became Warder & Child by 1860. John Glessner was hired as a bookkeeper by the firm in 1863. Three years later, the firm was reorganized as Warder, Mitchell & Company and John Glessner, then just 23 years of age, was taken in as a junior partner along with Asa Bushnell. John Glessner was made vice president in 1870, and immediately after his marriage to Frances Macbeth on December 7 of that year, moved to Chicago where he established the main sales office for the firm on Clinton Street. The building survived the Great Chicago Fire the following year. The final reorganization of the firm took place in 1879, when it became known as Warder, Bushnell & Glessner. Isaac Scott was hired to design a new headquarters for the firm in 1883. Unfortunately a portion of the building collapsed during construction, the result of a contractor’s negligence, not Scott’s design, but Scott was replaced by architect William W. Boyington, who completed the building later that year. The building (shown above) still stands at 130 S. Jefferson Street and is now known as the Glessner Center. Benjamin Warder retired from the firm by 1886 at which point he moved into his newly built house in Washington D.C. designed by H. H. Richardson. Asa Bushnell was made vice president and John Glessner the sole vice president. Asa Bushnell later served as the governor of Ohio from 1896 to 1900.